Betting is at the heart of horse racing. The thrill of winning a bet in horse racing can make up for a number of disappointments-in emotional if not numerical terms! Systematic wagering is possible under a pari-mutuel system, at a racecourse with professional stewardship. Choose the racecourses, or online racebooks, known for their reputation and image of fair play. Track and horse specialization pays off, though it takes alot of patience, effort and time. Study horses at the track. See how they perform. You do not have to bet on every race; wait until you know that odds favor your pick. Do not expect sustained windfalls, or look for short cuts. 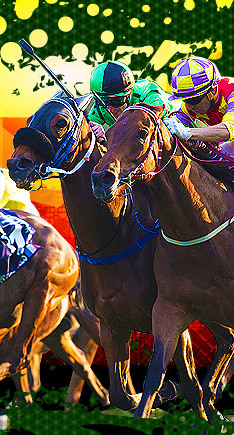 Stay away from illegal betting, and tracks which promote dangerous riding and outright cheating! Spread betting may sound like fun, but it reduces the probabilities of winning dramatically. Jackpots and the like are uncommon in real life, but every race does have a winner. Video screens are more for enjoying off-site horse racing, than for making money. Trackside insights matter. You are unlikely to win against punters at a distant site. But if you have mastered the art of picking a winning horse, betting onine can save a trip to the track. There is no shortage of theories and advice in the horse racing world. It helps to take all inputs in to consideration, provided that losses are kept within affordable limits so keep an account of your cumulative record. Harness Racing Generally speaking, the inside post positions (numbers one through four) are an advantage, especially on half-mile tracks. Thoroughbred Racing "Pace makes the race." This old racing expression points to another element to consider when placing your bets -- the pace of the race. Quarter Horse Racing Straightaway American Quarter Horse racing is an all-out burst of speed from the starting gate with every horse trying to put a head in front at the finish. THE TRIPLE CROWN This is the pinnacle of horse racing achievements. It requires winning three of the biggest stakes races in the world, all within a five-week stretch that starts on the first Saturday of May. THE KENTUCKY DERBY This is the first jewel of the Triple Crown. It is staged at Churchill Downs in Louisville, Kentucky on the first Saturday in May, capping the two-week-long Kentucky Derby Festival. THE PREAKNESS STAKES This the middle jewel of the Triple Crown. It was conceived through an agreement among sportsmen to stage a special race to commemorate a memorable occasion on a late summer evening in 1868. THE BELMONT STAKES This is the third jewel of the Triple Crown. It is held five weeks after the Kentucky Derby at Belmont Park in Elmont, New York. 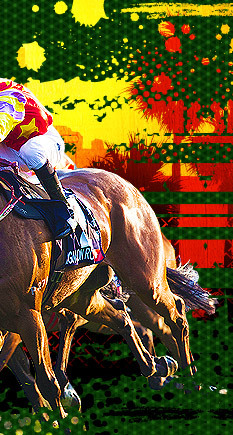 THE BREEDERS' CUP This is a one-day event held at a location that changes each year. 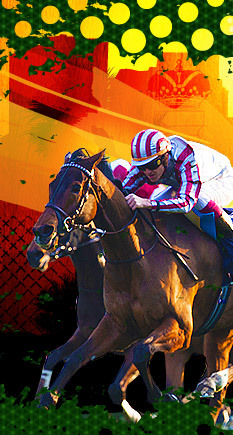 All the sites have been in the United States, except in 1996, when the races were held at Woodbine Racetrack in Canada. © 2006-2019 CarreraDeCaballos.net may link to third party websites and software. We do not endorse, and are NOT responsible or liable for any third party content, products, or services available from such websites. Online gambling may NOT be legal in your jurisdiction. Do NOT gamble online unless you have verified that it is legal for you to do so.